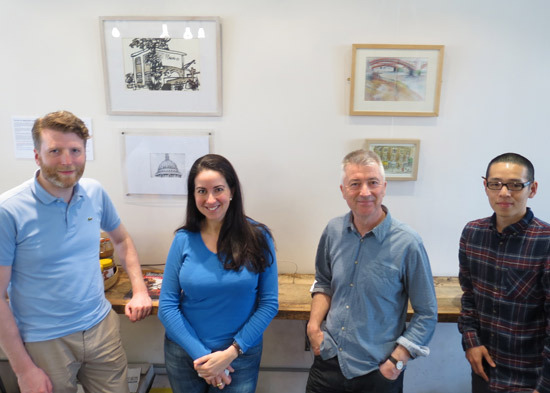 The fourth exhibition by London Urban Sketchers - and the third at branches of Timberyard - opens next week on Monday 2nd November. It's really great to be one of the launch exhibitions at a brand new branch of Timberyard in Soho - and for the exhibition to be on until the end of April 2016. WHEN: Monday 2nd November - 30th April 2016. Timberyard create workplaces for creative people fused with speciality tea and coffee. It's very appropriate that our exhibition should be associated with these brilliant coffee shops because very often after a sketchcrawl we go for a coffee. Then we admire each other's sketches and spend much time chatting about sketching kits! You can get involved with any one of our three linked events planned at present - we may have more in 2016! There is also a Book Event on 25th November - of which more later. I'll be signing my book alongside James Hobbs and Isobel Carmona with their books. Plus we'll have the latest books by other Urban Sketchers. As well as me, these the names of the other urban sketchers whose sketches are included in the exhibition: Sangeeta Bhagawati, Elizabeth Blunt, Nathan Brenville, Julie Bolus, Isabel Carmona, Jo Dungey, Katy Evans, James Hobbs, Isabelle Laliberte, Daniel Lloyd-Morgan, Choon Low, Dolores Kitchener, Tom Ledger, Paulina Little, Simone Menken, Olya Osipova, Simon Privett, Nick Richards, Evelyn Rowland, Sue Smith, John Swanson, Marissa Lee Swinghammer, and Tony Underhill. The sketches are a mix of ones done on our regular monthly sketchcrawls and those sketched while people have been out and about London. Links in the names are to their websites or blogs. Do please take a look at their other work.